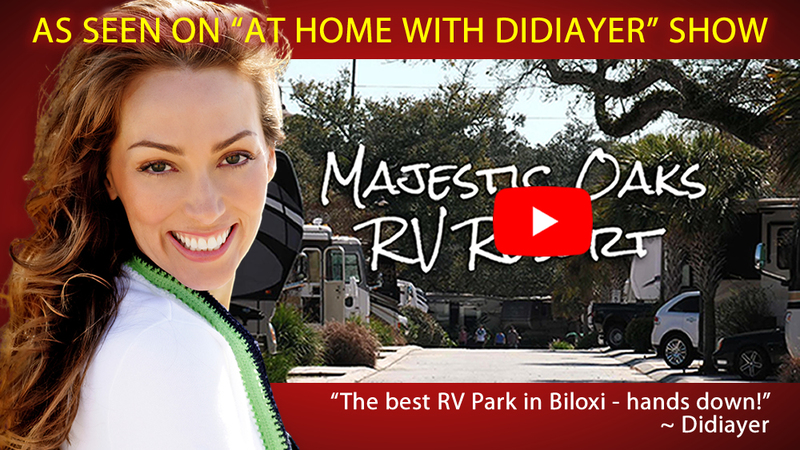 Majestic Oaks RV Resort in Biloxi is "The Gold Standard of RV Living on the Mississippi Gulf Coast" Just minutes from sparkling sand beaches, non-stop gaming, museums, restaurants, water parks, nature trails and much more! Reader's Digest Names Majestic Oaks RV Resort Best in State! Our rates are competitive... and we intend to keep them that way so you can get the most out of your travel dollars! View our map here & see a spectacular overhead view! We specialize in Southern hospitality... from free coffee to our inviting pool, cable tv, free wi-fi, full size laundry, propane station-even comfy rocking chairs on our shaded front porch! You're not just a guest, you have an open invitation to our many special events we host - including our Saturday cookouts! Plus...there's so many choices on our Coast - you'll NEVER see it all!